The people have voted-- for the Pittsburgh-based nonprofit Landforce which polled more online votes than three other groups to win the second round of the Google Impact Challenge Pittsburgh and $50,000. For being selected in the final four, each group received an initial $50,000 from Google. "We are so grateful to have been chosen as the Google Impact Challenge People's Choice. We will be using the award to build a program around green technologies like solar, energy efficiency, and other renewables," said Alyssa Manspeizer, Ph.D., Executive Director of Landforce. "This will allow us to build a more secure job pipeline, triple the number of people we serve within the next few years, and expand the kinds of environmental services we provide. Our fellow awardees for the initial Google Impact Challenge all have remarkable programs, and we have already learned so much from them, and between us are already exploring new initiatives that we could work on together. Google.org's generosity has already catalyzed so much for our organization, and we are deeply thankful for this opportunity." Landforce helps organizations restore and maintain land and green assets by providing professionally skilled people who can assist in those projects. And the restores lives in the process. 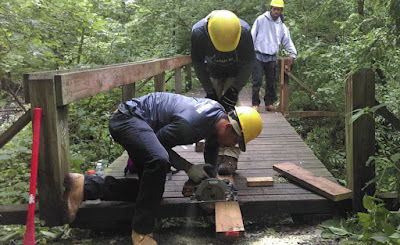 Crews from Landforce have built and maintained trails, restored habitats, stabilized vacant land, protected green infrastructure and improved the health of waterways. With their $100,000 grant, Landforce will scale their operations to ensure that everyone has the opportunity to earn livable wages by training people for jobs in environmental restoration. 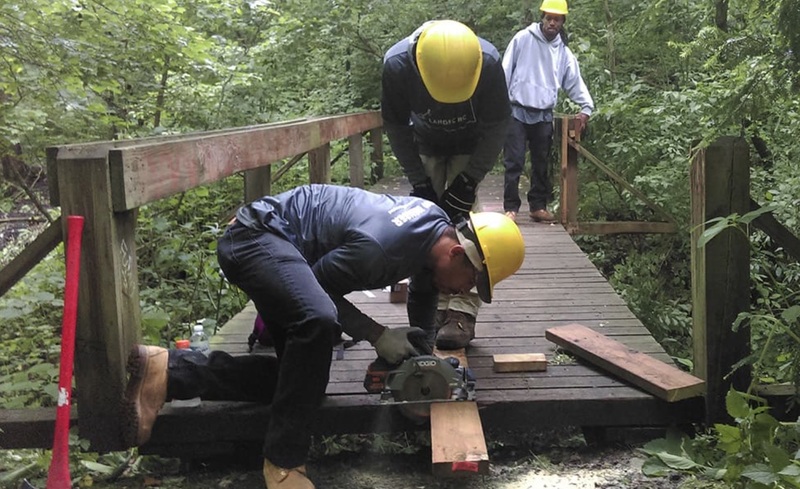 Their project will help 150+ people previously on public assistance to earn over $10 million in income, and to facilitate almost 110,000 hours of restoration work. In November 2017, Google launched the Google.org Impact Challenge Pittsburgh with an invitation to local Allegheny County nonprofits to submit proposals for bold ideas to grow economic opportunity in the local community. This announcement followed Google CEO Sundar Pichai’s announcement in Pittsburgh of the Grow with Google initiative to help create economic opportunity for Americans. The panel of advisors selecting the final four winners included Mary Frances Cooper, President and Director of Carnegie Library of Pittsburgh; Grant Oliphant, President of the Heinz Endowments; Charlie Batch, Former NFL quarterback for the Pittsburgh Steelers, Founder of Best of the Batch Foundation and Co-Founder of Impellia; and Kamal Nigam, Site Lead and Engineering Director, Google Pittsburgh. At 6’2” and 283 pounds, when Terrence Montgomery walks into a room, it comes as no surprise that he once played defensive tackle for the University of Oregon. What may come as a surprise is how soft-spoken, earnest and kind he is. When thinking back to the time right after he was kicked off the team in 2010, Terrence doesn’t blame what happened next in his life on “bad luck.” Rather, he owns the “string of very bad decisions” that led to his incarceration, protracted homelessness, and ultimate return to Pittsburgh. Terrance came to Landforce by way of the A. Philip Randolph Institute, and is now working full-time with the Allegheny County road crew. He credits his time working with Landforce with helping him learn what to expect in the workplace, preparing him for the intensity of teamwork, and instructing him on managing potential conflicts with his colleagues. Even more than enabling Terrance to start his job from a position of strength and understanding, he credits Landforce with a pride in the work he does that goes beyond his paycheck. Terrence is just one of the lives changed by Landforce. Click Here to vote for Landforce. Click Here to learn more about the program and contact them about a project you think they could help with.